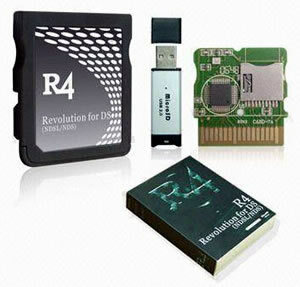 The R4 DS is basically another slot 1 flash kit for homebrew and game backups (aka ROMs). It is a new product made by a previously unknown team. Maybe they have been operating under other name previously but not to my knowledge. What is good about the R4 DS – you can run homebrew and ROMs, listen to music, watch videos etc. without any additional software. Just drag and drop whatever you want onto your MicroSD card, place it in the R4DS and here you go. - Supports the Soft Reset. R4 DS is delivered in a white cardboard box wrapped in another box. First impression of package is not so good as today the flash kits are sold in tin or wooden boxes, such as CycloDS. But the contents of the package will definitely please you, because the package includes R4 DS cart, replacement shell, small size CD- ROM (with installation instructions available in English and Chinese + five firmwares with different skins), Micro SD USB card reader, Dual DS card case. This all makes a quite a nice package with free accessories. Some of the freebies are sort of non- essential, however nice to receive. The cart is made of good quality plastic and fits perfectly into the console. The cart is not bumped by any chips sticking out under the label or anything – the quality is noticeable and cover is smooth and it looks like a genuine Nintendo flash card, you really wouldn’t tell from first glance. The Micro SD slot can be spring loaded which is a good thing. There is also a small groove that allows you to remove only the Micro SD instead of removing the R4 DS from the console which is convenient. Installation is very easy. Everything you need is in the manual CD, however I would suggest visiting their website first because the manual on CD is not their best product. Connect the USB reader to computer, format the SD card to FAT, choose the firmware skin and drag the folder onto your SD card. Once everything is formatted, you can drag and drop clean ROMs. As easy as it sounds. Plus the R4DS has the Moonshell which means you can watch movies, listen to MP3 files, view pictures and more. Also there is no need to update the Rom list as R4 DS detects the save type automatically. Game basically is all files on your SD card. Select the .NDS file you want to play and press “select”. Unfortunately you cannot use the touch screen when going through the file directory, which is a bit annoying. On the bottom screen you will always see a ROM with the title and its developer. Go ahead and load the ROM and you will be presented with a save- game option. ROMs will load within the seconds. Have fun! Multimedia offers you the Moonshell. It has already been described so many times I will not go into detail. If you still do not know Moonshell, google it. Moonshell will allow you to watch videos, listen to music etc. There are also additional options, such as Reset.mse, change back light, L/R lock and other. Boot Slot 2 provides an option to boot slot 2 cards from the R4DS interface. This PassMe option was tested with several slot 2 flash kits and it worked perfectly. Most of ROMs tested worked perfectly. Most of the homebrew worked just as fine. Some potential problems might arise ………..
R4DS Canada reliable store with same day shipping!